We gave this traditional home a stone and stucco exterior and a contemporary, open floor plan for extraordinary elegance and style. Formal living and dining rooms are located up front, while the casual, family areas of this home are located in back. Columns offer definition for the open family room, kitchen, and breakfast bay. The master suite features a sitting bay and private bath with ample closet space. A versatile second first-floor master suite with private bath and walk-in closet is located on the opposite side of the house. 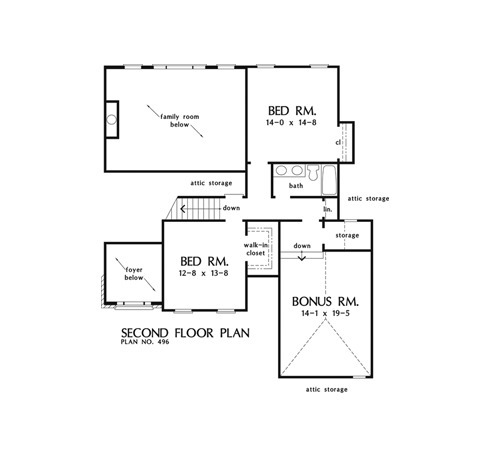 The second floor offers two more bedrooms, a full bath, and access to the bonus room. 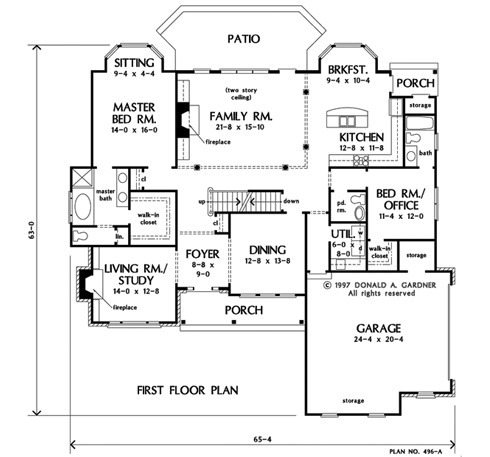 1st Floor: 2293 Sq. Ft.
2nd Floor: 623 Sq. Ft. Bonus Room: 359 Sq. 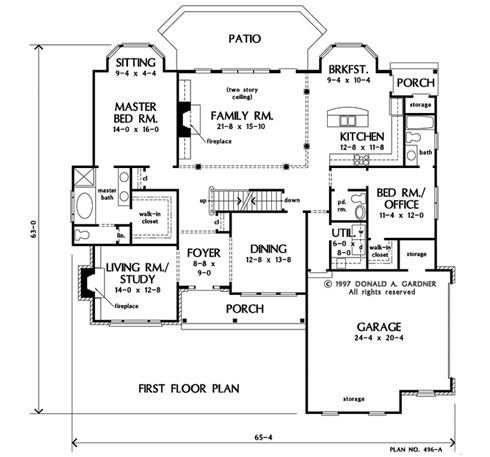 Ft.
House Dimensions: 65' 4" x 63' 1"
Great Room: 21' 8" x 15' 10"
Foyer (2 Story): 8' 8" x 9' 0" x 19' 0"
Great Room (2 Story): 21' 8" x 15' 10" x 19' 0"
Kitchen : 12' 8" x 11' 8" x 9' 0"
Utility Room : 6' 0" x 8' 0" x 8' 0"
Bonus Room (Vaulted): 14' 1" x 19' 5" x 12' 2"
Garage : 24' 4" x 20' 4" x 0' 0"
Garage Storage : 15' 8" x 3' 8" x 0' 0"
Bedroom #3 : 12' 8" x 13' 8" x 9' 0"
Bedroom #2 : 14' 0" x 14' 8" x 9' 0"
Bedroom #4 : 11' 4" x 12' 0" x 9' 0"
Storage (1st Fl.) : 2' 0" x 3' 4" x 0' 0"
Porch - Front : 21' 2" x 4' 11" x 0' 0"
Porch - Rear : 7' 11" x 4' 7" x 0' 0"
Deck / Patio : 26' 4" x 10' 0" x 0' 0"
Living Room : 14' 0" x 12' 8" x 9' 0"
Other : 9' 4" x 4' 4" x 9' 0"
Storage (Bonus) : 5' 0" x 2' 8" x 9' 0"
Storage (2nd Fl.) : 7' 3" x 4' 4" x 8' 0"
Storage (Other) : 6' 0" x 5' 0" x 0' 0"